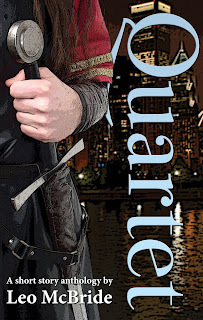 Now available on Amazon is the second edition of my fantasy anthology Quartet. With a new introduction, author notes on each of the stories, a new cover and a Q&A with me discussing the anthology, it is also down in price right now to just 99c in the US or 99p in the UK. Elsewhere in the world, it has a price drop too. Described as "a great read" by "an author that has fantastic potential", it contains four stories dipping their toe into the world of fantasy - sometimes in the modern world, sometimes not. Readers who have previously purchased Quartet can update to the latest edition by simply re-downloading the book. It may take a little while for Amazon to finish rolling out the new edition to each of the stores, so if your edition doesn't update right away, let me know by all means so I can check any problems for you. You can contact me on Twitter where my handle is @chippychatty.